Rings remain the most popular form of jewelry. They are bought, gifted and worn not just for fashion or style but are often worn to mark important events and occasions. 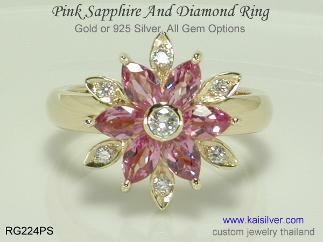 Kaisilver custom made rings are designed and crafted to look good, we give high importance to long term durability. Both silver and gold rings have the same quality standards, all rings can be crafted with your choice of design and gemstones. You can also pick any item from our websites and request for it to be crafted with your choice of gems in gold or 925 sterling silver. Few jewelers can match the high degree of customization that we provide, you need not limit your selection to what you see and read on our online resources. Custom gold rings are available in 14k and 18k gold, 10k gold rings can also be provided on request. With the demand for color in jewels going beyond colored gemstones, we provide all three gold colors for your selection. 10k, 14k and 18k gold rings can be ordered in yellow, white and pink gold. While we can custom make just about any ring for you, there are two ring trends that we have been instrumental in developing and spreading around the world. A decade ago, men were not too concerned about the jewelry that they wore, watches and shoes were given more importance. And when they did buy men's rings, the quality in terms of design, gems, craftsmanship and durability left much to be desired. Much to the disappointment of many other men's jewelry providers, it was Kaisilver who released the world's first collection of high end men's rings. The myth that well designed and crafted men's rings would not appear masculine enough was destroyed. Men today demand quality that is generally possible only with custom men's rings in gold or 925 silver. 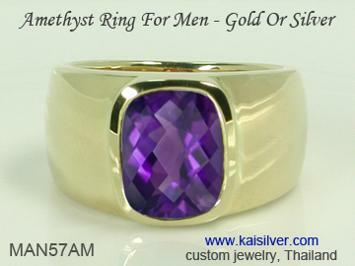 We custom make men's gold and sterling silver rings in all sizes, with or without gems and in sterling silver and gold. You choose the design for your ring from our websites or, email us images of your own. Browse through the Kaisilver Men's Rings section and you will realize, why we happen to be the more sought after source for men's rings. The beauty and meaning of the Claddagh ring has today spread all over the world. First made over 4 centuries ago by an Irish slave, the Claddagh ring is widely accepted as the world's most meaningful jewel. Kaisilver experts spent several months researching the significance and tradition of the Claddagh ring. Equipped with every single detail about this amazing jewel, we worked on a design that would look gorgeous, stay in shape for years and decades and retain the original meaning of the first ring made centuries ago. Quality jewelry buyers today regard our custom claddagh rings in gold and silver, to be the best rendition of the historic jewel. We craft gold and silver claddagh rings with the gemstone of your choice for both, men and ladies. The gemstone not only adds to the beauty of the ring, but can often be selected to enhance the meaning of the jewel. Read all about this legendary jewel with our Claddagh Ring Collection. 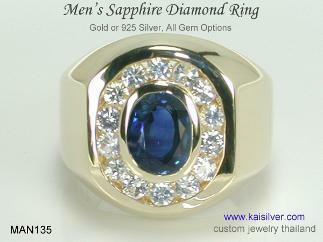 A men's custom made silver or gold sapphire diamond ring. You can choose the center gemstone for your ring and also, request for the diamonds to be replaced with rubies or sapphires ... more. 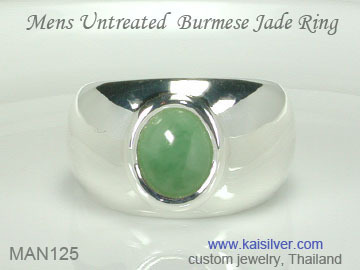 Custom green jade rings with natural untreated jadeite jade from Burma. Affordably priced, these sterling silver and gold jade gemstone rings can be made in all ring sizes with good durability ... more. 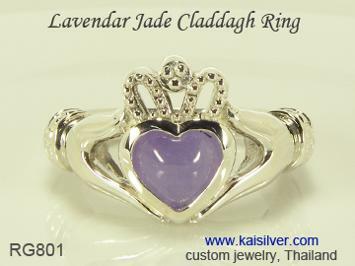 Widely accepted to be the best rendition of the 400 year old legend, custom made claddagh rings from Kai Silver are available in 14k and 18k gold or 925 silver with the gemstone of your choice ... more. Kaisilver has pioneered the development and crafting of fine men's rings with impressive looks and a high degree of durability. Custom cut gems are set in expertly crafted gold and silver rings ... more. 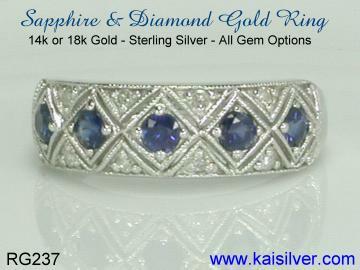 A gorgeous sapphire diamond ring at a very attractive price. Perfect for both daily and formal wear, this silver or gold sapphire ring offers some very interesting design variations ... more. 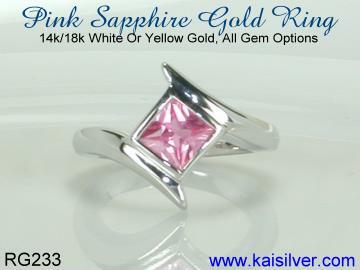 An elegant pink sapphire white gold ring, order this well designed and crafted square sapphire ring in gold or 925 sterling silver. 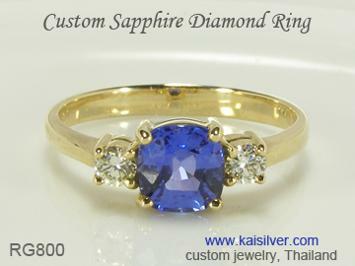 You can pick the sapphire gemstone color of your choice ... more. Based on the flower theme this gorgeous pink sapphire and diamond ring is a fine jewel, that is available in gold or silver. Like always, you choose the gems and the gold color for your ring ... more. 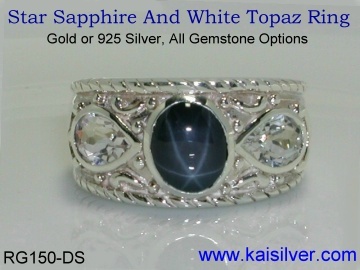 An antique style sterling silver ring with a diffused star blue sapphire gem in the center of the ring. Our team of artisans includes experts in every style of jewelry both, classic and contemporary ... more. When ordering a custom men's garnet ring from us, discuss the possibilities of getting a garnet that is not red for your ring. Shown here is a garnet diamond ring with a rare spessartite garnet gem ... more. 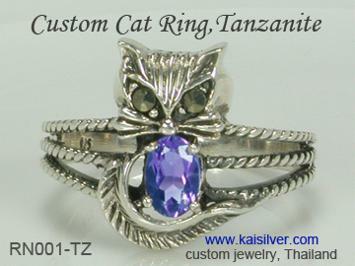 The versatile talents of Kaisilver craftsmen is showcased in this cute cat ring. Made to order in 925 sterling silver or gold, this gemstone cat ring can be ordered with any gem that you require ... more. If you happen to be a fan of sapphire jewelry, we suggest that you spend some time reviewing our sapphire ring collection. We offer a range of sapphire colors for you to choose from ... more. Bringing together fine workmanship that is not often seen and tanzanite, a gem that is about 1,000 times rarer than diamond. 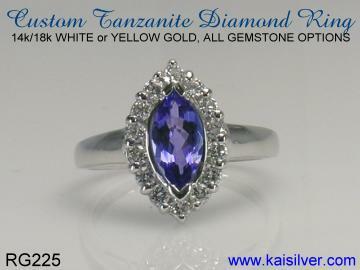 A scintillating tanzanite gemstone and diamond ring ... more. We provide fine quality custom rings in gold or 925 silver, the design can be yours or ours. The gem for your custom made ring can be picked by you, there are no limitations on gem selection. Made to order gold rings can be ordered in 14k or 18k, white, yellow or pink gold. If you prefer to wear a 10k gold custom made ring, contact our support team for a price quote. Sterling silver and gold custom rings, have the same quality of artisanship and gemstones. The metal weight for our jewelry is generally 40-60% more than what other jewelers provide. Optimum metal weight lays the foundation for a strong and sturdy jewel. Our custom made rings give equal importance to beauty and long term durability. 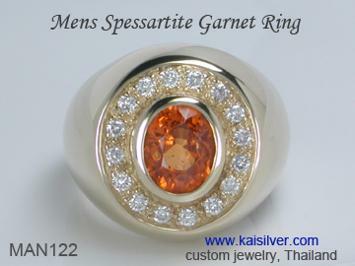 Kaisilver is credited with crafting the first collection of high end men's rings. Our claddagh rings are regarded as the finest rendition of the four century old ring. We custom make claddagh rings in gold or silver for men and ladies with, all gem options. How To Buy: We prefer not to build a web resource that is just about buying and selling, fine jewelry requires a lot more understanding and hurrying a purchase is neither in your interest nor ours. Every item on our website has a unique ID number and each of those jewels, can be customized in terms of design, size, dimensions, gemstones and metal. We can also custom make a ring or any other jewel for you with your own design concept, there will be no restrictions on design or gemstones. A price table is provided on every main product page, this gives you many options to choose from. We would encourage you to communicate with our team at sales@kaisilver.com and explain your requirements. You as a prospective buyer, are empowered to define every element of your jewel. In this scenario, you will require high quality support from trained gem and jewelry experts, mere sales talk will be a waste of your time. This is the Kaisilver way of operating and it has earned us more than, 7,000 jewelry clients from all 5 continents.